Macau, a coastal city that near to Hong Kong. Though there are a lot of modern building, newly build casinos and hotels, a lot of classical structure and different types of museums around Macau that attract tourists sight. Instead of these Cultural Heritages, the casinos in Macau is another mainstream for the Macau economy. Macau was once a colony of Portugal, therefore is not rare that the sign or name of landmarks in both Chinese and Portuguese. Macau is composed of Macau Peninsula, Coloane and Taipa. the mean of traffic was by ferries before 1974. On 5, Oct., 1974, the commissioned of Macau-Taipa Bridge (Ponte Governador Nobre de Carvalho) changed the mode of traffic and started from that day, commuters can travel by bus to and from Macau and Taipa. Ferry service soon replaced by bus and both bus operators, Fok Lei and CTPEMI, and this also made a chance for them to expand their networks. One thing had to be mentioned, 11 second-hand double decker, including two open-top, were introduced from UK for running on service to and from Taipa and Coloane after the opening of the bridge. Both bus operators undergone restructured after the new franchised launched in 1988, and they are known as Transmac and TCM respectively. The age of classic single and double decker serving in Macau street soon be a historical scenes. As the unique mode of traffic and the narrow conditions of Macau streets, minibuses were the backbone of both Transmac and TCM fleet to provide frequent service to passengers. Benefited from the growth of Macau's economic and completion of different casinos project, the demand of public transport was dramatically increased. There should be more opportunities for both bus operators, but since many frequent free shuttles provided by different casinos and shortage of drivers, the service standard of public bus service become very poor. Introduction of full-sized single decker was one of the solutions to relief the pressure on providing high frequency and also as a replacement for those aging minibuses. Among those new buses introduced, almost all of them are manufactured in China. In 2009, the Macau S.A.R. Government announced a series of policies to improve the public transport service standard. The construction of light rail system, linked with Portas Do Cerco and Pac On, was started in 2012 and finally, LRT system phase 1 is expected to be commissioned in 2019 as a result of a series of delay due to various difficulties encountered during construction. 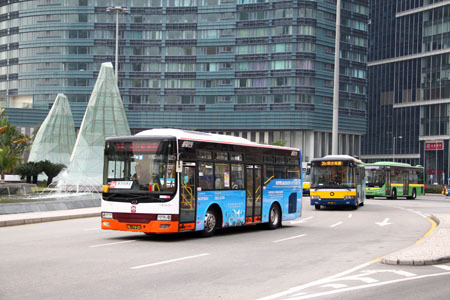 Moreover, a new mode of bus service was introduced on 1 Aug., 2011 to upgrade the service standard by improving the bus frequency, re-routing and expand the bus-bus interchange networks. 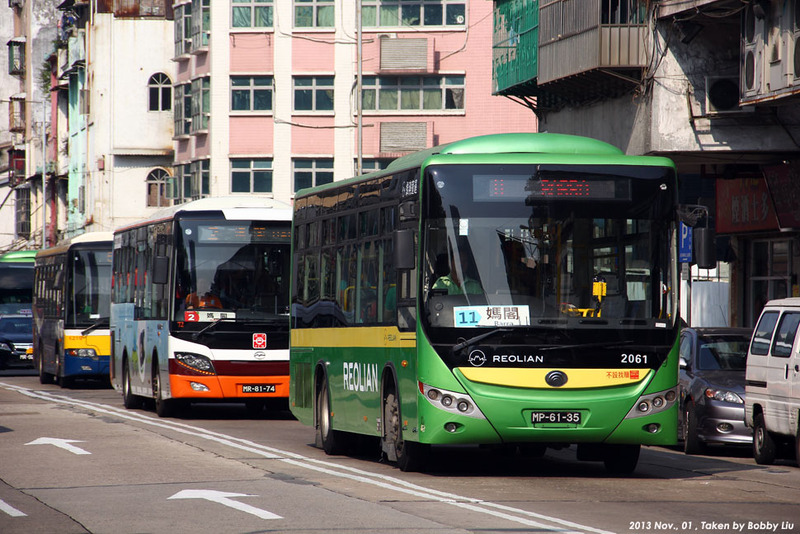 Three different bus operators, Transmac, TCM and Reolian provided bus service under the leading of Macau Government. The new bus operator Reolian is a joint venture of Veolia Transport RATP from France and HN Group based in Macau. Veolia also holding the Hong Kong Tramway Co. Ltd.
Reolian declared bankruptcy on 1 Oct., 2013 and as their statement said, this was a result of the great deficit and the fee paid by the Macau S.A.R. Government cannot be adjusted. As to maintain the normal bus service, Reolian was taken over by D.S.A.T of Macau until the end of Apr., 2014. In early Dec., 2013, Reolian was declared to be bankrupted by the court. The entire network and fleet operated by Reolian finally taken over by Macau Nova Era de Autocarro Publico, S.A. (New Era) since 1 Jul., 2014 and this contract was signed on 9 Jun., 2014. After 7 years of the launched of new bus operation mode, we can see there were changes among the public bus market in Macau and since 1 Aug., 2018, the number of bus operators in Macau backed to the origin as New Era merged with sister company, T.C.M and the latter become the largest public bus operator in Macau. You can have brief understanding about the background and the fleet of Tranmsac, T.C.M and New Era respectively with the help of photographs.